We feel very privileged to share with you what your support has made possible in the year 2012-13. It’s been a year of new beginnings, forging new partnerships, taking stock and recasting our vision for the future. It has been a fulfilling year for us on many levels. In keeping with our belief that sustainable change is only possible when we look at children, their rights and their situation holistically, CRY UK along with its grassroots-level projects was able to transform the lives of 22,286 children from 199 rural and tribal communities based in the Gujarat and Jharkhand regions of India. This was possible because of your continuous and generous support. Today, these children have a voice to express their opinion and a right to participate in decisions determining their future. They are able to demand a school within their vicinity and ensure that it has basic facilities such as toilets, blackboards, hot and well-cooked mid-day meals and even a teacher. Your support has enabled such empowerment that children, their parents and the entire community can stand up and demand what is rightfully theirs. Another focus area in 2012-13 was raising awareness and much needed funds. Events like CRY UK’s Corporate Cricket Tournament and our Annual Dinner Benefit - Pledge 2012 allowed people from all walks of life to participate in ensuring lasting change for children and amplify the message of every child’s right to a happy childhood. In addition to these events, we ventured out into Ireland with the formation of ‘Students for CRY’ - a new volunteer group. This group has been successful in generating awareness and support for CRY UK in Ireland through several exciting activities. During the year, we also engaged with many new supporters. Please do click the tabs above to read how each of them, in their unique way, participated in ensuring that underprivileged children attain their rights to a happy and healthy childhood. This newsletter will also give you a glimpse of how support from you and our partners has helped CRY UK ensure a lasting change for thousands of children in India. As our supporters, each of you gives us reason to believe that our dream for a better future for every child in India is possible. And we want to thank you for your continued support towards turning that dream into a reality. We hope to meet and interact with you in our upcoming 2013-14 events including our summer cricket challenge and annual dinner benefit. We would like to hear your thoughts and ideas on how we can work together for our children. Please do write to us at cry.uk@crymail.org. P.S: If you know of organisations or individuals who would be interested in supporting CRY UK just like you do, please write to us at cry.uk@crymail.org with their contact details. We would highly appreciate it. From quality mid-day meals, access to education, availability of drinking water and healthcare facilities, to realising their dreams of becoming a nurse or an engineer - the lives of 22,286 underprivileged children from 199 rural and tribal villages have been changed forever. This has been possible because of your generous support, and the belief that, "If we all do something, then together there is no problem that we cannot solve." Click here to see the change your contribution made possible. Bat for the underprivileged children in India. While you make runs for your team, you shall also end up scoring for thousands of children in India. On March 16th and April 27th several individuals came together and walked for the cause of child rights with leading historian Mr. Nick Robins. With 'East India Company' as a theme, the charity walk explored the multiple layers of history behind London’s city buildings/monuments and their connection with India. A big thank you to Mr. Nick Robins and all those who walked with us! 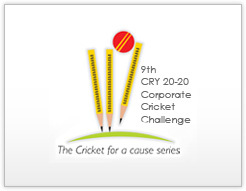 The CRY Corporate Cricket Challenge (4Cs) 2012, featured 13 teams from London’s leading corporate firms in the IT, Consultancy and the Banking sectors. Cognizant won the tournament in the grand finale against the London Business School team. Former Indian wicket-keeper and batsman Farokh Engineer presided over the opening ceremonies. Total proceeds raised from the event were £20,000. Click here to see pictures from the event. Cambridge University Hindu Cultural Society (CUHCS) and CRY UK came together for CUHCS's annual cultural event - MASTANA 2013. With over 80 performers and 1000 attendees, the art show was a mix of traditional and urban Asian dance forms, comedy, live music, and entertainment. This joint initiative was one of the prominent and niche platforms which helped CRY UK raise awareness on the cause of underprivileged children in India. 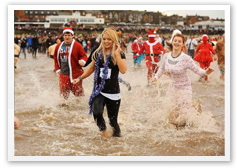 Kingston Smith, a top accountancy firm in the UK donated £500 to CRY UK during the holiday season in 2012. Kingston Smith made a corporate decision to not send paper Christmas cards in 2012 and instead donate any savings to three charities. CRY UK was a recipient and very grateful to the management of Kingston Smith for this initiative. Forty-six children of Wimbledon High, while learning about India in class, organised an Indian market workshop in support of CRY UK. The girls from the class made items from scrap and waste products. Mothers of the children who participated organised a bake sale and along with the girls raised a total of £600. A big thank you to the mothers, daughters and staff of Wimbledon High School for their support. 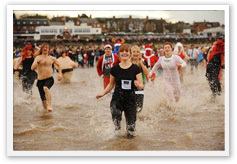 Faye Evans and her sister Katie Evans from Norfolk, UK swam in their local village to raise funds for children in India. The sisters managed to raise £180 to fight the cause of child labour and exploitation. Thanks to Faye and Katie for their support. 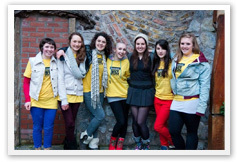 A group of Irish students – 'Students for CRY' have been raising awareness and funds for CRY UK in Ireland. Through various activities, they have raised £2,000 for CRY UK since November 2012. 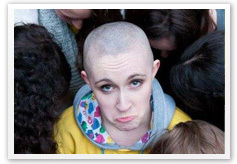 As their most recent initiative, Áine Ní Loingsigh – a member of the group – shaved her head off for the cause. A big thank you to all of them for all their support! 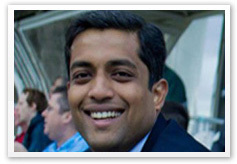 Fifteen employees of Accenture embarked on a sponsored walk for CRY UK in August 2012. The walk, which was in Yorkshire helped raise awareness and funds for CRY UK. Thank you to all the employees who participated in the charity walk. Treat Rights is an initiative where partnering restaurants enable individuals to contribute £1 from their bill to CRY UK. 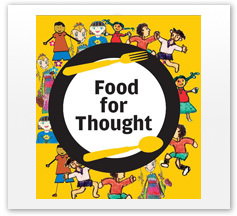 Three Indian restaurants - Quillion, Bombay Brasserie and Café Namaste – kicked off this initiative in May-June 2012 and raised £2,000 for the cause. In February 2013, two new restaurants – Imlii in Birmingham and Trishna in London - signed-up to be a part of this initiative. CRY UK introduced ‘Adopt a Hamlet’ - an initiative through which by contributing £250 a year you can ensure all children in a hamlet have an enriching and rightful childhood. This would ensure an environment with functional schools where they can learn and fill their mind with ideas, nutritious food to eat, clean drinking water, a space to play and interact with their friends and the freedom to express their thoughts and opinions. Dhruv Jajodia, a 6-year old boy, walked for child rights and raised £649 for CRY UK. Like Dhruv, you can also fundraise for the cause with our new initiative- ‘My Occasion and CRY UK’. With 'My Occasion' you can celebrate your special day– birthday, wedding, anniversary or an achievement – by ensuring happiness for children in India. Regular attendance. Regular check-ups. Regular meals. Support us to make change regularly. Contribute a small amount every month which can go a long way towards ensuring every right for every child. Click here to set up standing instructions with us. CRY - Child Rights and You UK (CRY UK) is a registered non-profit organisation working for every child's right to a childhood - to live, learn, grow and play. Along with grassroots partners, we work with parents and communities and have ensured lasting change in the lives of 22,286 underprivileged children from 199 rural and tribal villages in India. Child Rights and You UK is registered charity no. 1119026. For more information visit www.uk.cry.org or write to cry.uk@crymail.org. If you do not wish to receive further emails, or if you have received this message in error, please accept our apologies and simply unsubscribe.